Crossing The Line can do so ahead of her five rivals in Chelmsford's Bet totetrifecta At totesport.com Handicap. Andrew Balding's filly returns to the Polytrack with an air of unfinished business, having excelled with back-to-back summer wins on turf since going very close in a valuable handicap at this track in June. Since that course-and-distance neck second, she has upped the ante with victories at Chester and York which have earned her a 9lb ratings rise in all. She banked almost £44,000 for connections at the Knavesmire in August, earning herself a deserved break before this return for a winter campaign. Crossing The Line has yet to win on this surface, having also finished runner-up - by just a head on that occasion - in a novice event over six furlongs at Lingfield in May on her only other attempt. She was thought good enough last year for a shot at the Group One Cheveley Park Stakes, in which she finished a 12-length 10th of 11 to Clemmie. At three, the Cape Cross filly has undoubtedly found her niche at seven furlongs and with David Probert back on board to try to add to their two successes together so far, albeit one in the stewards' room after yet another close second, they should be in business again. Global Wonder discovered the winning knack at his 17th and most recent attempt - and can demonstrate it was no fluke in the Bet toteexacta At totesport.com Handicap ar Chelmsford. Over jumps at Wincanton, Printing Dollars looks a sound investment in the Hunts Food Service Mares' Maiden Hurdle. CHELMSFORD: 6.00 Deep Intrigue, 6.30 Global Wonder, 7.00 Restive Spirit, 7.30 CROSSING THE LINE (NAP), 8.00 Cuillin, 8.30 Saaheq, 9.00 Captain Ryan. CLONMEL: 12.05 Makka Pakka, 12.40 Dontdooddson, 1.15 Scarpeta, 1.45 Pump Road, 2.20 Aherlow, 2.50 Lacken Bridge, 3.25 Western Honour. LEICESTER: 12.35 Early Learner, 1.10 Never Equalled, 1.40 Ballyfarsoon, 2.15 St John's, 2.45 Miro, 3.20 Hope's Wishes. MARKET RASEN: 12.15 King D'Argent, 12.50 General Custard, 1.20 Royal Act, 1.55 Blakerigg, 2.25 Jam Session, 3.00 Point N Shoot, 3.30 Love Lane. 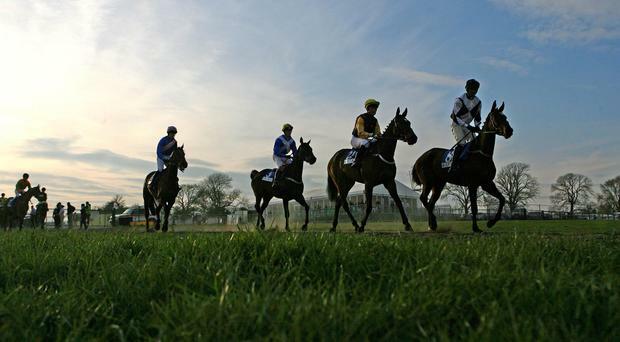 WINCANTON: 12.25 Rhythm Is A Dancer, 1.00 Printing Dollars, 1.30 Some Chaos, 2.05 Dino Velvet, 2.35 Lizzie Langton, 3.10 Baron Du Plessis, 3.40 Chance A Tune. DOUBLE: Crossing The Line and Restive Spirit. By Graham Clark Willie Mullins smashed his BoyleSports Irish Grand National hoodoo as Burrows Saint led home a one-two-three for the trainer in the marathon handicap chase at Fairyhouse. By Michael Verney With €100k (£87k) up for grabs in today's RYBO Handicap Hurdle (4.40pm) at Fairyhouse, it's no wonder that it has attracted a few English raiders. By Michael O'Sullivan Ted Walsh's Cheltenham Festival winner Any Second Now features among a maximum field of 30 declared for the BoyleSports Irish Grand National at Fairyhouse on Monday.